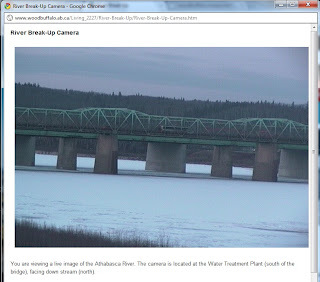 Every year at this time, residents of Fort McMurray crane their necks as they're crossing the bridge to see if they can catch a rare glimpse of the river break event. It is the rite of passage from winter to spring, an annual observance ripe with the potential of devastation. River break always entails a chance of an ice jam. When the ice bottoms out and piles up, the water has nowhere else to go but up the Clearwater River and into the low lying areas of the lower townsite of Fort McMurray, Waterways and Draper. You can soak in the anticipation from the safety of your friendly neighborhood computer screen thanks to a webcam that stands watch, scoping out the stretch of the Athabasca just south of the Grant MacEwan bridge. The last time we got hit was in 1997, before that, 20 years earlier in 1977 when the water was "4 feet high at the Newfie Club," said longtime resident Mark Humeniuk. It is a rare event that inspires a level of complacency that is difficult to avoid. 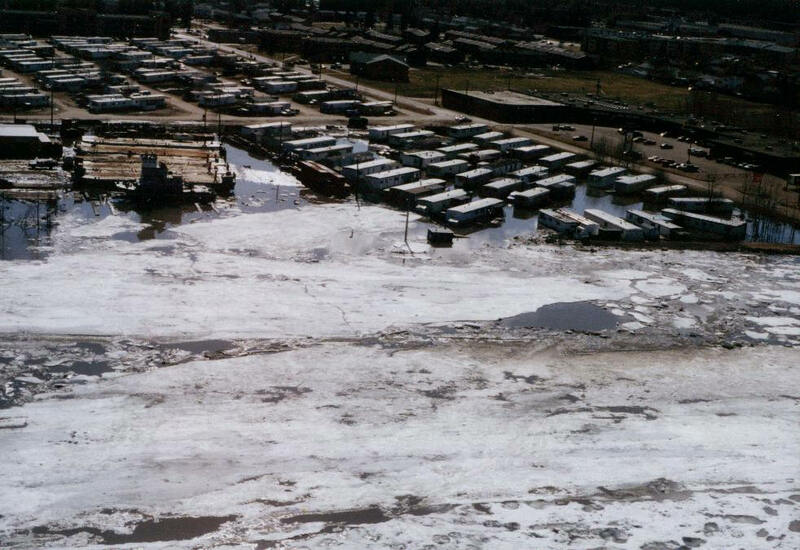 This is a picture from Alberta Environment that shows how the 1997 flood put much of the Reidel Trailer Court under water. 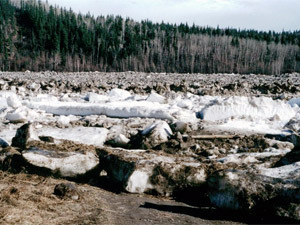 I was on the media side of things14 years ago when the ice jammed up at the confluence of the Clearwater and Athabasca Rivers. It was an intense couple of days as municipal staff struggled to find a solution for a massive collection of ice that refused to budge. I vaguely recall that a plan was hatched to bomb the jam in an attempt to get things moving. My recollection is that things let go before that interesting step had to be taken. We live in the "D" zone, or the area that sits at an elevation that only gets affected when the water level reaches a particular point. 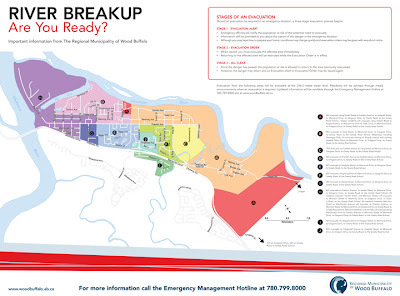 The area that was once a trailer park at the end of Reidel is most at risk, along with the flats in Draper, followed by Waterways and the Keyano College/Composite High School/Heritage Park area. Our neighbors had 4-inches of water in their basement in '97, though our house was spared. If you're on the fringes of a flood, a lot depends on how well your basement and its requisite plumbing pieces are sealed. Much like the silent majority, we harbor no sense of panic that a flood is likely or even possible. Sadly, we get the emergency brochure in the mail and don't give it much attention, outside of looking at the evacuation map. That said, there was quite a high level of risk a number of years ago when we went so far as to get everything up off the floor in the basement. One of my fellow Councillors asked a sage question at the meeting tonight as to what we could/should do to better engage people in the preparedness process, outside of the regular brochure drop, radio messages and newspaper ads. 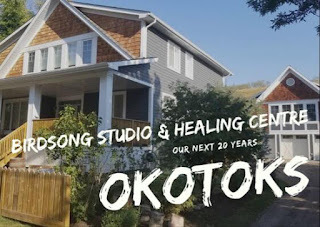 "I probably got a brochure at my home and my work," said Councillor Allen. "I'm embarrassed to say that I very well might have missed both and they likely ended up in my paper recycling." 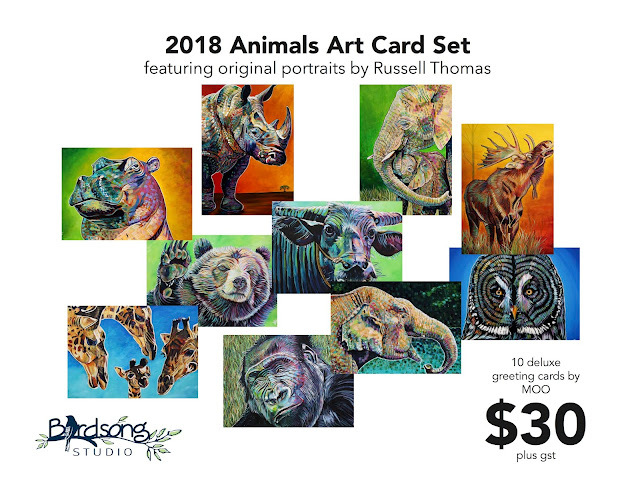 With the voluminous paper we get in our mailbox which comprises 90 percent of the mountain of paper in a blue bin under our desk, it is easy to understand how brochures go unnoticed. I just happened to spot ours when it arrived and pulled it aside as a reference piece, but I recognize that I was one of the lucky ones. IF you live in the lower townsite of Fort McMurray, Waterways or Draper, I would strongly recommend that you take 10 or 15 minutes to review this valuable material. When an emergency event happens, time is short, and having even a modecum of understanding about what to do will make a tremendous difference. "We're in the red zone," I said to the media folks following tonight's meeting. "Starting today and through the next two weeks, the river is more than likely going to give way." History suggests that April 19th would be a solid bet, if you are ponying up a few dollars in an office pool. Ice thickness is average, temperatures have been below the mean, and the snow pack is higher than normal. Add all those factors up and they say we have a higher than average risk of ice jam and potential flooding. In the unlikely event that the water starts to rise or if you need more information, call the Emergency Management Hotline at 780-799-8000. While it's quiet now, if things start to happen, that will become the most popular number in town.